I love Osso Buco.. especially this time of year. The meat just falls off the bone. It’s rich, flavorful, and I will take this over pot roast any time! As with any favorite dish of mine, I am constantly evolving on the recipes. Osso Bucco II is slightly different from my previous OB recipe, in that I have changed the vegetables and flavorings around a bit. I’m still using the great In The Kitchen With Scotty seasonings and sauces though! 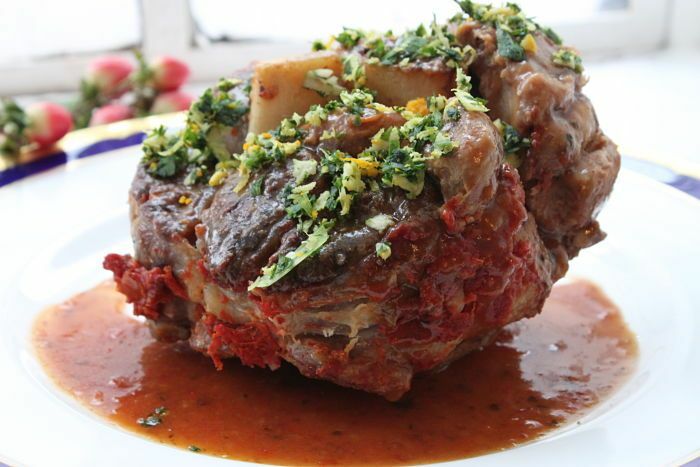 Place your tied osso buco on a flat surface and generously sprinkle both sides with the “Roast Beast Seasoning” . In a large roasting pan or dutch oven, begin heating up the olive oil until shimmering on top of your stove. Gently lay down each piece of OB into the oil to sear/brown on each side. While all of that is going on, in a food processor combine the onion, fennel, celery, and garlic, and process to a corse paste. Remove the seared and browned OB from the pan and discard the oil. Careful, it’s hot. Add some fresh oil to the pan and begin heating. Pour the course paste from the food processor into the pan and begin cooking. Add the pepper flakes, and cook until nicely caramelized. Pour in the white wine, the Chile Pepper and Lime cooking sauce, and the tomato paste. Be sure to scrape up all the tasty bits from the searing on the bottom of the pan, and mix everything in well. Reduce the liquid down a bit to concentrate the flavors.. about 10 minutes. Snuggle in the OB shanks, and pour water on top until the mixture slightly covers the shanks. Taste the sauce for flavoring and add Cook’s Line Seasoning or salt and pepper to taste. Add the thyme and bay leaf bundle. Cover the pan and place in the oven for 1 hour. After one hour Carefully check the pan to see if the more liquid is needed.. and add water. Cover and cook for another hour. Total of two hours. Remove the Osso Buco from the oven and uncover. Remove the whole pieces of meat carefully to a platter and cover to keep warm. On the stove top heat the sauce slowly until it has reduced and thickened. If it is already thick enough for your taste… then leave it. Way to go! Prepare the gremolata, by mixing everything in a bowl. That is after you have zested, smashed, chopped, and minced everything. To serve, place a generous scoop of the sauce into the bottom of your plate or shallow pasta bowl. Add the osso buco on top, and finish with a generous sprinkle of gremolata. Serve with a creamy risotto or any type of legume/bean. Dig in!